Since having a baby a year ago, the words “I’m sorry” have taken over my life. “I’m sorry I missed your birthday.” “I’m sorry I’m delayed in replying.” “I’m sorry I missed your call.” “I’m sorry it took me four months to send you a thank you card.” These two words come out of my mouth so often that they’ve taken over my vocabulary. I’m a big fan of taking responsibility and personal accountability. I think being accountable is easier than passing the buck. When I’m accountable, I have more power and control. When someone else is accountable, I have neither. But there’s a difference between being accountable and apologizing for yourself. Of late, I’ve been apologizing for myself, and it’s demoralizing. Even telling you this, my clients, feels risky. Don’t worry. I arrived at every speaking engagement this year early and got great feedback. But anyone who knows me well knows I’m working on all the things I write about. Last week I vowed to stop saying, “I’m sorry.” And yet, the next words out of my mouth were apologetic. Apologizing for oneself is so natural, it’s pervasive, aka, a hard habit to break. Be accountable: Establish clear priorities and boundaries. When I had a baby, I set very clear guidelines for myself on work hours and travel practices. And I stick to those 99% of the time. Having clearly established boundaries makes decision making easy. Be accountable: Only commit to things you know you will do. For personal situations, only commit to things you genuinely want to do. Be accountable: Tell the truth. If you don’t plan to do something, say so, without apology. “Thank you but no” has a lot of power. Be accountable: Know your limits and what you need to be healthy and functioning at an optimum level. If you need eight hours of sleep, structure your life to get it. If you need weekends focused on your family, do that. If a trip home over the holidays feels like too much, don’t go. Taking care of yourself enables you to take care of others. Be accountable: Renegotiate when you need to. If you realize something you agreed to isn’t feasible or in your best interest, renegotiate versus suffer through it. Or, keep your commitment, but don’t recommit the next time a similar opportunity or request comes around. Be accountable: Don’t sweat the small stuff. I love you all and you will never get a printed holiday card from me. Ever. I want to send you one. I really do. Just pretend you got it and it has a really cute picture of me and the baby on it. Be accountable: Give yourself a break. You’re doing the best you can. You’re a human like everyone else. We’re all doing the best we can. 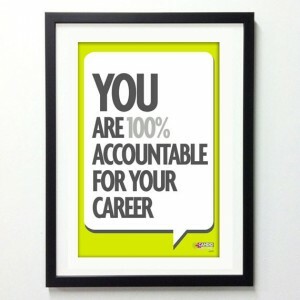 Being accountable isn’t being perfect. It’s being human with points for effort. Be yourself. Take care of yourself. And do your best, unapologetically. Last week some unknown person sent me emails predicting my future. According to the anonymous clairvoyant, in ten years my life will be going well. I’ll have a son who is bright but doesn’t apply himself (shocking), and I’ll be offered a job in Oshkosh that I shouldn’t take. After the third predictive email, the sender wanted to know if I had questions about my future. I didn’t. The whole thing was wildly creepy. No one should take advice from someone with this much discretionary time. The emailer needs a volunteer job. Why would I want someone else to tell me my future? That’s something I enjoy creating. I’ve got a friend who feels a black cloud follows her. She feels bad things repeatedly happen to her and there’s nothing she does to create these situations, which is, of course, complete garbage. It may be easier to blame someone or something for the bad things that happen to you, but if someone else is responsible, you have no control. And if you have no control over what happens to you, there is nothing you can do to create the life you really want. I see myself as 100% responsible for everything that happens to me. As antithetical as it sounds, life is easier when I’m accountable. If I miss a plane because of traffic, I should have left for the airport earlier. If I get overcharged in a restaurant, I should have checked the bill more carefully. If I do a bunch of work for a client and later find out that the work I did isn’t what the client really wanted, I should have asked more questions upfront and asked for feedback earlier. When I’m responsible for what happens to me, I have some control. When someone else is responsible, I have no control. I’ll admit to going to a psychic…once. In 2001 I took a transfer from Denver to New York. Living in New York was fun and exciting, and great for my career, but I didn’t enjoy living in such an urban city. I agonized over what to do for two years – go back to Denver, stay in New York, or move someplace else? Desperately unhappy, but not being able to make a decision, I went to see a psychic. Clearly I had given up. I was going to let someone I’d never met, who didn’t know anything about me, decide my future. Unless you’re at the Jersey Shore and decide to have your palm read for fun, seeing a psychic is abdicating responsibility for your life. Instead of seeking answers about what might happen, pursue the things you want. If you want a different job in your organization, tell someone who can do something about it. If you got passed over for a job, ask the hiring manager for feedback of what would have made you a better candidate. If the hiring manager doesn’t give you any information, ask your current boss to get the information for you. If one of your co-workers excludes you from projects, ask him why. If someone you work with seems to dislike you, ask for feedback about what you did to damage the relationship. Regardless of how challenging the situation and how disappointing the results, there is ALWAYS something you did to either contribute to the situation or something you can do to change the situation. I don’t mean to tell you what to do. Nor do I mean to minimize how hard some life circumstances are. But I do want you to see yourself as in charge of what happens to you. Asking, “What do I really want, and what’s one thing I can do right now to get closer to that goal?” Then take one step. Then take one more, and so on. If negative things are happening, ask, “What could I have done differently to have a different outcome?” Or, ask, “If I could do this over again, what would I do differently.” Then next time, do it differently. Regardless of how hard or bad something is, there is ALWAYS something you can do to make the situation better. Take your life, your career and your relationships into your own hands, where they belong. Email us if you want this career management phrase on a poster, note card, notebook, or magnet.